Today's session would prove to be quite brutal despite my poor eating habits lately. My right knee was still giving me problems so I excused myself from hamstring training once again. I really miss it and can&apos;t wait to get back to hitting the legs. I just don&apos;t feel right training everything else but legs. Today was a rest day and all that&apos;s all I did. It just seems that all I&apos;ve been doing is resting lately. Oh well, you can&apos;t grow without rest. Today&apos;s session would prove to be quite brutal despite my poor eating habits lately. Dave and I met at the gym around 9:00 PM which was a big change from what we normally do. With the summer here and no school, we just train at our leisure without worries of studying, etc. We began with some warming up on the bike and just skipped the stretching. I felt good and was sweating a little already. We loaded the e-z preacher curl bar with 70 lbs and began our workout. Using a narrow grip and the steep side of the preacher bench, I performed 15 reps and then 12 reps to warm up. My biceps were pumped after the first set! Then I increased the weight to 90 lbs and performed a set of 8 and then a set of 7 reps. After only 4 sets, I felt as if I had already endured 10 sets of biceps punishment. Next came 1 arm preacher curls using the steep side of the bench. Starting with a 40 lb dumbbell, I performed 10 reps per arm. Then I increased to a 45 lb dumbbell and performed 7 reps per side. I remember the 2nd set hurting so bad that my eyes began to water. Now that&apos;s pain! Next came standing alternating dumbbell curls. I used to perform this exercise all of the time but opted for stationary biceps movements because of the cheating factor. I really don&apos;t cheat that much but I wanted isolation more than anything. After a long absence, I have reintroduced the exercise back into my routine. Using 45s, I performed 2 sets of 16 alternating reps which equates to 8 reps per arm. All I can say is that it was excruciating pain but I miss it a lot. Next came e-z cable curls starting with 100 lbs for 13 reps. This was pretty easy so I went up to 120 lbs and only managed 8 reps. I sacrificed 5 reps for 20 lbs which is different than what I&apos;m used to on the cable machine. 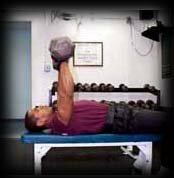 For our final biceps exercise, we performed 1 arm hammer curls on the preacher bench. Now this is one exercise where it is absolutely impossible to cheat. Word of advice: when you grab the dumbbell, grab it with your tightest grip because this will help you more than you think. Using a 35 lb dumbbell, I managed 2 sets of 6 reps per arm. I know it&apos;s a slight drop from last time (5 lbs) but we did more movements for biceps this time. Now it was time to hit the triceps. We started with regular dips performing 2 sets of 15 reps per set just to get the muscle warm. Now it was time for some reverse grip e-z triceps pushdowns. Starting with 120, I performed 15 reps which was too easy. I turned to Dave and said: "I just wasted a set." For my next set, I increased the weight to 160 and still managed 15 reps. This was still too easy. So for my final set, I increased the weight to the entire stack of 200 lbs and performed 10 reps. This was more like it. It was hard but not too hard and my form was good. Next came one arm dumbbell overhead extensions. Starting with 30 lbs, I managed 12 reps per side. This was also really easy so I just stopped at 12. For my next set, went up to 35 lbs and still managed 12 reps but this was much more challenging. I actually had to fight to get that last rep in on both sides. For our final exercise, we performed close grip bench press. I typically use a grip which keeps my hands about 12 inches apart from one another to minimize stress on my wrists. Starting with 185 lbs, I managed 8 reps which wasn&apos;t too bad. On my next set, I increased the poundage to 225 and managed 5 reps. This was a personal best for me on this exercise so I was happy. Once again, another awesome arm workout despite my feelings towards arm training. Ok, it&apos;s been almost 2 weeks since my unfortunate knee injury so I decided to give it a little test run. I know this is dangerous but I&apos;m going to have to try this sooner or later. The gym was almost empty because of summer break but that&apos;s the way we like it. We began with the usual warm up and then proceeded to the leg extension machine. I started with 20 lbs and performed 20 reps. Not too bad but I made sure to perform each rep slowly and intentionally. I then went to the lying leg curl machine to perform a superset. With my feet together on the padding, I performed 15 reps with 60 lbs. Then it was back to the leg extension machine using 60 lbs for 20 reps going slow once again. Afterwards, I performed lying leg curls again using 80 lbs for 15 reps. Performing these two movements felt really good and my knee was feeling ok. For my final superset, I used 100 lbs for 15 reps on the leg extension machine and 100 lbs for 15 reps on the lying leg curl machine. I managed to get a little bit of a pump but nothing extraordinary. Next came squats. I knew that if my knee could withstand some light squatting, then I was on the road to recovery. Starting with 135, I performed 2 sets of 15 reps. Not too bad. Then I increased to 225 and managed 3 sets of 10 reps. I had a pump in my legs now and I was quite happy about that. My first leg pump in almost 2 weeks. I could tell that my leg training had taken a major dip but it&apos;s only a matter of time before I&apos;m back at full strength. After squats, I just guided Dave through the rest of the quad workout acting primarily as a trainer. To finish off my quads, I performed walking lunges with Dave for 2 sets of 60 alternating steps. These are so much easier when your quads are dead tired! Hahaha. Training on a Friday has always been a bummer for me and today was no different. Today would mark the first day of my new diet where I will actually increase my calories and begin to eat clean. This is something I haven&apos;t done consistently in a long time. I decided that I wouldn&apos;t compete this summer and just use this time to add on some appreciable size. I&apos;m not one for going to the beach anyways. Today was a scheduled chest day and I was feeling more motivated than usual. We met earlier in the day around 11:00 AM to train because we both had things to do. Dave and I began with the usual 5 minutes on the bike and some stretching. As we walked away from the bike, he headed towards the incline bench thinking that was what we were going to do but I had other plans. We were going to train some abs first. We started out with decline crunches for 2 sets of 20 reps just to get the muscle warm. My abs were really tight and even stretching did little to help with this tightness. Then we used a 45 lb plate for added resistance and performed 2 sets of 20 reps. The last few reps on the 2nd set proved to be extremely tough and I can tell that my ab strength has dipped a lot in the past 2 years. Next came back to back sets of seated knee-ups. I performed 2 sets of 30 reps making sure to feel the tightness in my abs on each rep. After this quick rendition of abdominal work, I had a good sweat going and knew it was time to hit the pecs. We started off with something new today: bench press. We slapped on 135 and I performed 15 easy reps. This felt somewhat awkward still but it&apos;s been a long time since we&apos;ve done flat bench press to start off a workout. Next came 185 for 8 easy reps. Finally it was 225 for 6 easy reps. This was our warm up and now it was time to work. We put on 275 and I threw up 5 reps for my first set and then 4 reps for my next set. Not bad at all for not having benched in months. If I remember correctly, I left off at 295 for 7 reps before succumbing to a shoulder injury which kept me out of the gym for a month. Next came flat dumbbell presses. The trend today was to concentrate on flat work because we have focused primarily on incline work the past 5 months. Using 100s, I managed a set of 7 reps and then a set of 6 reps, respectively. Next came flat dumbbell flyes. This exercise would prove to be harder than usual because I was already starting to feel fatigued. Maybe I&apos;m just getting old or maybe I just train that much more intensely now than I ever have. Using 70s, I managed 2 sets of 6 reps on flat dumbbell flyes. After all of this flat work, it was now time to hit the upper pecs. We did this using the trusty incline bench press. We put on 185 and I managed only 2 sets of 6 reps. Wow, this was a lot harder than it had ever been. I&apos;m sure you can guess why too. For our final exercise, we performed high cable crossovers. My chest was pumped to the max and I knew this last exercise would make everything go numb. Starting at 70 lbs per side, I performed 15 relatively easy reps. Damnit! I hate performing 15 reps when I could have gone a little heavier. I think it&apos;s a waste of the little energy and effort that I have left. For my next set, I used 80 lbs per side and performed 10 reps. This was more to my liking. All out exertion to the point of numbness. You gotta love it! Dave and I decided to train at 9:00 PM today which is the time I used to train when I was back at Berry. I really miss training at this time because you have the whole day to fill up with carbs. I&apos;ve trained at all times of the day and my best training sessions came when I was training at 8:00 PM or later. I have read literature which suggests that the testosterone to cortisol ratio is better at night than it is in the morning. You can take this piece of information for what it&apos;s worth but to me, I just get better pumps. To start off our session, we began with the usual 5 minutes on the bike and then some stretching. Now it was time to train. We began with front pull-ups, as usual. I performed 3 sets for 10 reps, 10 reps, and 8 reps, respectively. I know my pull-up reps are lessening but I&apos;m feeling it more in my back than I ever have. This can only lead me to one conclusion: I&apos;m doing them with better form now. Next came barbell rows using an overhand grip. Starting with 135, I performed 12 easy reps. Then it was up to 185 lbs for 10 easy reps. Now it was time to work. I used 225 and managed 8 solid reps. I could have gotten 2 or 3 more reps in but I didn&apos;t want to totally destroy my form. If you do this exercise wrong, you&apos;re more than likely wasting your time. After my "heavy" set, I moved the weight back down to 185 and performed one last set of 12 reps. Man, my back was pumped but I could tell that it was only the beginning. Next came curl grip pulldowns using a grip about 12 inches apart. Starting with 120 lbs, I managed 12 fairly difficult reps. This wasn&apos;t too bad so I increased the weight to 140 lbs and banged out 8 solid reps. This was painful but I don&apos;t give a f*#@. It works and that&apos;s all I need to know. Next we performed seated cable rows to help add that mid back thickness. Starting with 120 lbs, I managed 12 relatively easy reps. I made sure to squeeze my shoulder blades together for that peak contraction. You won&apos;t believe how much of a difference this makes. For my next set, I increased the weight to 140 lbs and managed 8 reps. Now it was time to perform another pulldown motion: medium grip front pulldowns. Using 120 lbs and a shoulder wide grip, I performed a set of 6 reps and 7 reps, respectively. What a pump! I had no idea this would be the kind of pump I would get. In actuality, I wasn&apos;t even sure if today would be a good training day or not. I guess my questions have been laid to rest. Next came t-bar rows using an overhand grip. Starting with 135 lbs, I managed 8 reps and then with 160 lbs, I managed 7 reps. I must say, my intensity and motivation is starting to come back when I&apos;m in the gym. However, I feel that I won&apos;t reach my true training potential as I have in the past unless my motivation runs high outside of the gym. I believe this will come with time. We weren&apos;t finished yet. Next came 1 arm cable rows or as I like to call them: lawnmower pulls. Starting with 120 lbs, I managed 15 reps per side. Then I increased the weight to 150 lbs and banged out 12 reps per side. Now came sumo style deadlifts. F*#@! I haven&apos;t deadlifted in over 2 weeks and I knew this would kill me. Oh well... time to deadlift. We put on 225 and I performed 10 reps. Not too bad. Next came the only work set using 315 for 10 reps. I didn&apos;t want to go too heavy because we still deadlift once a week from here until the contest. Next back session is when we will deadlift 365 or higher for reps. Now that back training was done, it was time to hit the traps briefly but intensely. First off, we performed standing dumbbell shrugs. Using 100s, I performed 2 sets of 15 reps. I could go much heavier than this but there is no need to do so. 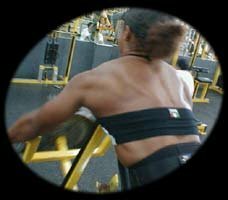 All going heavy will do is give you sloping traps which take away from your width. Next came upright rows, an exercise which I haven&apos;t done since late 2001. Using only 95 lbs and trying to keep my form perfect, I performed 2 sets of 10 reps. This felt extremely awkward but I know I need to do them. I sure was glad to be done with that session. I was tired but I had an out of this world pump. Yes, I have been very happy with my training in the gym the past week or so and hope this will continue.